You head EAST and arrive in VERY LARGE ROOM decorated in a kind of NOUVEAU MEDIEVAL STYLE, based loosely on NEO-CASTELLAN REVIVAL SENSIBILITIES, merged with a DISTINCTIVE FAUX-"JE NE SAIS QUOI" that speaks volumes about the designers' OBJECTIVES and SCHOOLS OF THOUGHT. However, you don't have time for any of that CRAP. Little IMP GUYS infest this portion of the room as well, three of them (that you can see). 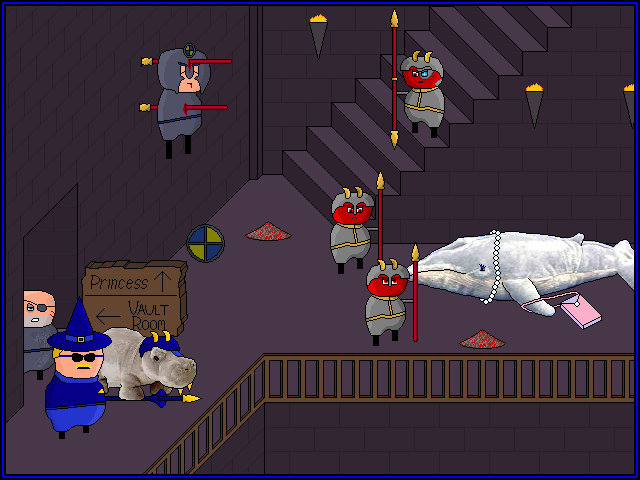 Two of them are accosting a noble TEDDY WHALE (who bears a PURSE and a STRING OF PEARLS) while a third, watching with a CYBORG EYE from the stairs above, has spotted YOU and your PARTY. He bellows to his CRONIES to prepare a suitable DEATH for you. The poor STUFFED SEA CREATURE, being a rough approximation of a NORMAL SEA CREATURE, seems quite unable to defend herself on LAND (or CASTLE FLOOR, as the case may be (and is)). She mews at you miserably. Padington vs lower cadimp, you = fist vs middle cadimp, grizzled old man vs cyborg cadimp. triple threat, GO! Cast WAVE POOL, giving the TEDDY WHALE and HIPPO the aquatic advantage!